This annotated bibliography has been developed to support AG Bell public policy initiatives. Research has been included about typical language development, language development for children who are deaf or hard of hearing (D/HH), bilingual language development, bilingual-bimodal language development, cochlear implant outcomes, psychosocial development, literacy and parent choice. The majority of the articles were published in 2012 or later. A few articles published prior to 2012 have been included because of the importance of the research reported. Allen, T. E., and Enns, C. (2013). A psychometric study of the ASL receptive skills test when administered to deaf 3-, 4-, and 5-year-old children. Sign Language Studies. 14(1). The authors of this article reported the results of the ASL Receptive Skills Test (ASL-RST), adapted from the British Sign Language (BSL) Receptive Skills Test, as a valid and reliable measure for monitoring the progress of children acquiring sign language. Results showed the ASL-RST can be used to measure grammatical knowledge of ASL for developing signers at a young age. Children (various Ns were reported) at ages 3, 4 and 5 years and who had been exposed to ASL by the age of 3 years were included. All of the children had nonverbal IQs of at least 70. Some of the children had hearing parents while others were from deaf parents. The authors state the test is not intended to be a diagnostic tool, but rather a measure of a child’s ASL skill acquisition. The most important finding of this study is the confirmation that parent input is critical to language acquisition. The authors found children of deaf parents had significantly higher scores than those with hearing parents who did not use ASL--which is an expected outcome given the purpose of the test was to measure the acquisition of ASL. However, the authors extrapolate the data and state that their findings prove and confirm the importance of early exposure to ASL even though the results only demonstrate that receptive ASL can be measured. Ginsborg, J. (2006). The effects of socioeconomic status on children’s language acquisition and use. Chapter from Language and Social Disadvantage: Theory into Practice, Edited by J. Clegg and J. Ginsborg. John Wiley & Sons, Ltd. Retrieved from https://researchgate.net/publication/237448474. Children from low SES backgrounds are significantly more likely to demonstrate a moderate or severe expressive language delay resulting in academic underachievement and causing social and cognitive disadvantage. This author explains that family income is a better predictor of both nonverbal and verbal intelligence than are ethnicity, maternal education and whether a child resides in a one or two-parent home. Although all of the crucial aspects of mother-child interactions are yet to be identified, the quantity of speech addressed to and with children is a significant factor for the successful acquisition of language. Mothers from low SES background were found to have a tendency to use more directive speech (e.g, “put on your shoes” or “eat your lunch”) and prohibitions (“don’t do that” or “ no”) than did mothers from high SES backgrounds. Directive speech is typically one-way in nature, e.g., get your shoes; eat your vegetables; go to bed, and does not encourage or facilitate conversation, exchanges, turn taking and other important language development activities. Findings from other research studies of mother-child language interactions where the child is deaf or hard of hearing are discussed. According to the author, there are some studies that indicate the mothers of children who are deaf or hard of hearing tend to use more directive speech, regardless of SES than did those of typically hearing children. It is therefore important that teachers, interventionists and language therapists working with children who are deaf or hard of hearing and their parents, must provide education and support to help the mothers learn to use child-directed conversation. The authors of this article argue that deaf children should be taught a sign language in early years. Evidence they present to support this position comes from bilingual research with spoken languages. However, it is used here as evidence for a bilingual bimodal approach to language development for children who are deaf or hard of hearing. As these authors state both “sign language and spoken language provide normal pathways to language acquisition, evidence for which is often disregarded.” Because first language acquisition occurs naturally and successfully during the first few years of life the authors recommend that all deaf newborns and newly deafened small children learn a sign language, regardless of whether or not they receive a cochlear implant or hearing aid. This recommendation, however, does not take into account the fact that 95% of children who are born DHH are born to hearing parents--parents who use spoken language. In order for these parents to raise their children using a sign language the parents would need to become fluent, or at the least proficient, in the language in order to model and facilitate their child’s acquisition of the sign language. This expectation is unrealistic. These authors argue that cochlear implants (CI), which have become the standard of care for deaf children in developing countries, harm most children because the children are not exposed to sign language. Lack of exposure to sign language, they argue, harms the children and causes linguistic deprivation as they believe sign language to be the primary and most appropriate language for deaf children. They go on to state that the harms from cochlear implantation of children extend to society because of the failure of children to acquire appropriate language resulting in academic failure and later dependence on social systems for lifelong support. No study has yet shown, according to these authors, that a congenitally deaf child learns spoken language by means of the implant so that he/she can cope with normal communication outside the laboratory. Recommend sign language to parents. Adjust expectations for cochlear implants. Coordinate delivery of medical services to the deaf child across relevant health professionals. Study successful CI users and learn how to better predict for whom a CI will be successful (this requires agreement on standards of success). The views presented in this article are frequently offered to support the recommendations that children who are deaf must be raised using signed language, such as ASL, if they are to experience academic and life success. This position has not yet been supported by scientific research and there is significant evidence that this belief is in fact not true. Children who are deaf or hard of hearing (DHH) develop sign language in a manner that is similar to the way hearing children develop spoken language, provided they are in a language-rich environment with fluent language models. The characteristics of this environment affect development. Children who are DHH and who have signing deaf parents (about 5%) are typically surrounded by deaf adults and children who use sign language and thus learn the language through natural interactive experiences. Children who are DHH and who have hearing parents (about 95%) require various kinds of supports to provide their children with accessible visual or spoken languages. For example, hearing parents who want to raise their child using a visual language (e.g., ASL) must become fluent in the language and create opportunities for their child and family to interact with other children and adults who use the same language. The majority of hearing parents today choose to raise their children using a spoken language. Their children may need technology, such as hearing aids or cochlear implants, to enhance their auditory pathways so he/she can acquire the spoken language of the home. Parental fluency and the presence of other adults and children who use the chosen language clearly influence the rate and patterns of learning the language. One of the most significant factors predicting successful language acquisition for children is parent involvement. A larger proportion of children today who are DHH are acquiring spoken language within age ranges typical for hearing children when compared to children in the past. Good language skills in a first language are essential for reading success. This article reviews evidence of the effect of visual languages on neural function in deaf children and their relation to cochlear implant (CI) success. The authors propose that children who are congenitally deaf must be exposed to a visual language, e.g., ASL, early in life during the sensitive period for language learning. If this opportunity is missed, these children may experience poor long-term language outcomes in any language (signed or spoken) even with the presence of residual auditory plasticity. Therefore, children should be exposed to both visual and spoken languages pre- and post-implant to ensure the best possible language outcomes according to these authors. The authors purport that no study of neural function prior to implantation has systematically measured proficiency in visual language and its relation to outcomes following CI. Thus, they say it is “hazardous” to draw conclusions or make generalizations about the role of visual language in CI success meaning it should not be discounted. They go on to support their position by citing “evidence” from studies of deaf children of deaf parents who learned sign language during the critical period for language acquisition and who outperformed deaf children of hearing parents following CI on measures of auditory language skills. What is missing from the ”evidence” that is offered is outcome data for deaf children of hearing parents. The evidence they do offer confirms that children who are exposed to the language of their parents, home and community during the critical period for language acquisition are more likely to acquire a solid language foundation than are children who are raised to use a language that is not the language of their parents, the home or the community in which they live. The National Association of the Deaf (NAD) encourages the development of legislation to ensure age appropriate language acquisition and development for every child who is deaf or hard of hearing (DHH) beginning at birth. Further, it is the responsibility of government agencies at federal and state levels to develop safeguards to ensure every child who is DHH is progressing on a developmental path commensurate with children who hear. According to NAD, improvement in the education of children who are DHH lies in early exposure and development of signed language fluency. Lack of exposure to sign language has resulted in “language deprivation” and is the result of a child not receiving sufficient language input to acquire or learn any language. This outcome is a significant problem attributed to the emphasis on spoken language rather than sign language. According to these authors, the crucial link for early reading success is not between segmental sounds and print but rather to the brain’s capacity to segment, categorize, and discern linguistic patterning, making it possible for early learners to segment all languages, including signed languages. A model of “visual sign phonology” (VSP) is presented and discussed in this article and the authors offer the model as a way to facilitate reading for all children--hearing and deaf. The VSP model is based on the philosophy that phonological capacity (breaking a word down into its component parts) is built from the brain’s segmentation, categorization, and pattern-discerning capacities and constitutes the essential capacities from which all human phonology arises. Sound is not necessary for these capacities to mature as it is the natural patterning of language experienced in rich, socially-contingent linguistic interactions experienced in the first months of life that are key. Research supporting the model from developmental psycholinguistics, cognitive neuroscience and reading are briefly discussed. Four predictions (i.e., outcomes) of VSP are offered. Deaf children with VSP exposure will develop VSP knowledge. All children who are deaf or hard of hearing with early VSP exposure will show fundamental advantages in reading compared to those without early VSP exposure. Deaf signers from deaf parents are more than twice as likely to be skilled readers than deaf signers from hearing parents. Late exposed signers will have weaker reading skills than early signers because their weaker phonological segmentation abilities impede reading processes. Hearing children with select reading difficulties will benefit from visual segmentation training in VSP. The statements and proofs offered here are extrapolations using ideas and concepts to draw conclusions based on theory. Until scientific studies are conducted to test these hypotheses empirically, this model can only be considered theoretical. Ambrose, S. E., Walker, E. A., Unflat-Berry, L. M., Oleson, J. J., and Moeller, M. P. (2015). Quantity and quality of caregivers’ linguistic input to 18-month and 3-year-old children who are hard of hearing. Ear and Hearing, 36, 48S-59S. The linguistic input provided by caregivers is the most important element of a child’s early language environment. The quantity and quality of the input is important, as is the ability of the child to access and process the linguistic input they are provided. For children who are hard of hearing, access to language is critical. These authors compared the quality and quantity of linguistic input for children diagnosed as hard of hearing with that of same age hearing peers. Children were assessed at 18 months and again at 3 years of age. Quantity of input was found to be more stable over time than was the quality of the input. For example, caregivers who provided children with the least complex input in the early years continued to provide less complex input as the child aged. Additionally, children with greater degrees of hearing loss were exposed to both poorer quantity and quality input presumably because the caregivers found it more challenging to communicate with them and so they did not. Additionally, the language used by caregivers with children who had greater degrees of hearing loss tended to be directive (e.g., saying “get your shoes” while pointing to the shoes) than conversational. These findings support the need to coach caregivers to provide higher amounts of quality linguistic input and to adopt a conversational, rather than directive style. There are many variables that impact optimal auditory development for children who are deaf or hard of hearing so that they are able to acquire spoken language, such as age at amplification, optimally fit hearing aids or cochlear implants in good working order, auditory training, child expectations and parental involvement. Clinicians must carefully monitor each of these variables to ensure a child will successfully learn to hear and talk. These authors suggest that clinicians must consider anything that interferes with the goal of hearing and talking be considered a “red flag” and offer suggestions for refocusing on the goal. Child Expectations: Children with hearing loss should be compared to typically developing hearing peers and clinicians must continually monitor progress towards developmental and communicative milestones. When a child’s progress falls too far behind same age peers with typical hearing (e.g., 6 months) progress should be “red flagged” and appropriate steps taken to close this gap. Parent Engagement: Parents must be engaged and actively participate in their child’s intervention. Lack of parental engagement is a major “red flag” and requires a commitment on the part of interventionists to learn to embrace parent participation as a key element of their intervention. Because few professionals are skilled at structuring their habilitation with the intentional goal of involving parents and other members of a child’s family, training must be provided to improve the skills of clinicians to engage parents. Hearing Technology and Audition: Another potential “red flag” is the use of audition continuously throughout a child’s day. This includes more than simply wearing hearing technology. Children must be expected to listen and to master all developmentally age-appropriate targets. In order for this to happen, hearing technology must be appropriately fit and be in good functional working condition. One of the most important factors determining infants’ benefit and success in spoken language development via amplification is early auditory experiences from infant interactions with caregivers, i.e., infant-directed speech. This author examined whether children with congenital hearing loss who had hearing aids or cochlear implants responded to infant-directed speech in the same way as children with typical hearing. Using research from the Babytalk Research Laboratory this author found that infants with typical hearing preferred infant-directed rather than adult-directed speech. Infants with mild-to-moderate hearing loss also preferred infant directed-speech, though it took them a little longer to develop their preference. Infants with cochlear implants did not show a preference for infant-directed speech over adult-directed speech until 9 to 12 months post implantation. Although more research is needed, these findings have implications for caregiver-infant interactions and spoken language development. If an infant does not appear to be paying active attention to a caregiver’s attempt to entertain or soothe them using infant-directed speech, will they continue to try? Or will they change their speech? Parents must be coached and guided to use infant-directed speech and adapt their interactions as needed, for example using repetition. Blaiser, K. and Muñoz, K. (2009) Collaboration/accelerating outcomes. Presentation at ASHA convention, New Orleans, LA. Collaboration among professionals and parents actively working to teach children to listen and talk from an early age is critical to their success. Primary care physicians, audiologists, speech-language pathologists, early interventionists, and parents must work together to ensure optimal outcomes for children who are deaf or hard of hearing to teach a child to listen and talk. Professionals must work with parents to teach them the skills necessary to ensure continuous access to hearing for their children. 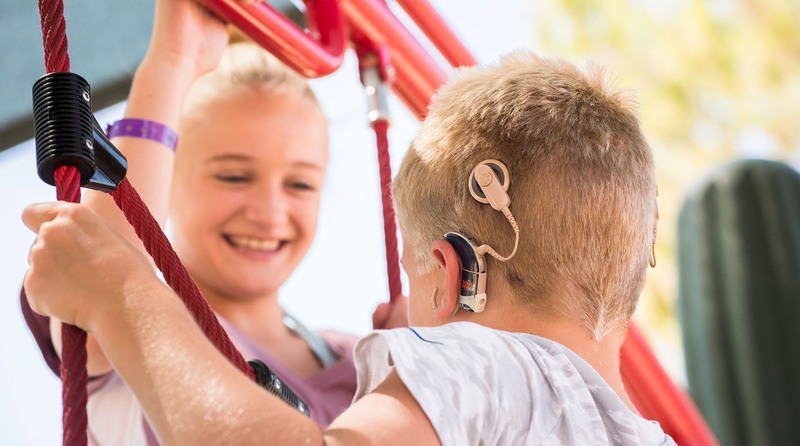 Research findings from the Longitudinal Outcomes of Children With Hearing Impairment (LOCHI) study were presented in this article about the effectiveness of early intervention for improving outcomes of children with congenital hearing loss. This study included 451 children diagnosed with a hearing loss who had accessed pediatric hearing services by the age of three. Children were assessed on speech, language, and psychosocial outcomes at 6 and 12 months following initial hearing aid amplification or CI and again at chronological ages 3 and 5 years. Children were categorized according to communication mode as reported by parents--oral, manual, or combined. At 3 years, the children in the study scored below the normative populations on global English language development. Severity of hearing loss, gender, presence of additional disabilities, maternal education, and age at CI significantly influenced outcomes. By 5 years of age, there was clear and strong evidence that intervention at an early age was associated with better outcomes. Higher maternal education, use of an oral mode of communication, and the absence of additional disabilities were also significantly linked to higher language scores. This study provides evidence of the effectiveness of early intervention for improving outcomes of children with hearing loss. Additionally, findings revealed that it may be necessary to implement strategies targeting the development of phonological awareness skills to support children’s development of literacy skills in formal education. Moeller, M. P., Tomblin, J. B., and the OCHL Collaboration. (2015). Epilogue: Conclusions and implications for research and practice. Ear and Hearing. 36, 92S-98S. Children with mild-to-severe HL are at risk for depressed language development, and the risk increases with the severity of unaided hearing levels. Provision of well-fit hearing aids HAs) reduces risk and provides some degree of protection against language delay. Greater aided audibility is associated with better language outcomes in preschool. A substantial proportion (more than half) of children’s HAs were not fit optimally, which negatively impacted aided audibility. Early HA provision results in better early language outcomes, but later-fit children were able to demonstrate accelerated growth patterns once aided. Consistent HA use provides some protection against language delay and supports auditory development. Qualitative dimensions of caregiver input influence child language outcomes, i.e., quality is more important than than quantity of language interactions. Both receptive language abilities and aided audibility influenced children’s functional auditory and speech recognition skills. Children who are hard of hearing (CHH) appear to be at particular risk for delays in structural aspects (i.e., form) of language. Sole reliance on norm-referenced scores may overestimate the outcomes of CHH. Aided audibility, HA use, and characteristics of the language environment interact to moderate the influence of HL on children’s outcomes. Walker, E. A., McCreery, R. W., Spratford, M., Oleson, J. J., Van Vuren, J., Bentler, R., Roush, P. and Moeller, M. P. (2015) Trends and predictors of longitudinal hearing aids use for children who are hard of hearing. Ear and Hearing, 36(1), 38S-47S. The purpose of the study reported by these authors was to characterize long-term hearing aid use in children who are hard of hearing based on parent-reporting and to identify factors that influence longitudinal trends in hearing aid use. The subjects for this study were parents of 290 children with mild to severe hearing loss from the Outcomes of Children with Hearing Loss (OCHL) longitudinal study. Parents completed a hearing aid use questionnaire and participated in face-to-face interviews each time they visited the research site--two times annually for children under age 2 and annually for children 2 years and older until the age of 9. Additionally audiologists obtained data logging information about the actual average use of hearing aids per day. Parents tended to overestimate the amount of time their children wore their hearing aids. This was especially true for parents whose children had better hearing. This finding indicates there is a need for ongoing support for parents about the importance of hearing aid use even at the earliest of ages and how to address any problems parents may be experiencing keeping hearing aids on their young children. Children did demonstrate an increase in the use of hearing aids as they grew older. Because the benefits of hearing aid use are cumulative over time, providers must continually remind parents of the benefits of hearing aid use. Yoshinaga-Itano, C., Sedey, A. L., Wiggin, M., and Chung, W. (2017). Early hearing detection and vocabulary of children with hearing loss. Pediatric. 140(2):e20162964. The purpose of this study was to examine the impact of current EHDI 1-3-6 policy (screened for hearing loss by 1 month; hearing loss diagnosed by 3 months; amplified and enrolled in early intervention by 6 months) on expressive vocabulary outcomes across a wide geographic area and secondarily to confirm the impact of other demographic variables previously reported to be related to language outcomes. Subjects were 448 children with bilateral hearing loss between the ages of 8 and 39 months selected from the National Early Childhood Assessment Project. These children lived in 12 different states. Overall, the children in this study scored lower than expected on measures of vocabulary as measured by the MacArthur-Bates Communicative Development Inventories, a norm-referenced assessment. A vocabulary quotient of 100 indicates that a child’s vocabulary age is commensurate with his or her chronological age. The mean score for the children in this study was 82, considerably less than the expected 100. Children who were younger, had no additional disabilities, had mild to moderate degrees of hearing loss, had parents who were deaf or hard of hearing, and whose mothers had higher levels of education showed higher vocabulary quotients than those who did not meet these criteria. These results are consistent with previous studies showing vocabulary acquisition decreases as children who are deaf or hard of hearing increase in chronological age (i.e., don’t keep pace with hearing children) and underscore the importance of current efforts to decrease the age at which children are identified with hearing loss and enrolled in EI. Additionally, given that a substantial proportion of children performed below average, understanding the additional factors that influence vocabulary development is crucial. The onset of the use of a baby’s home language signals an important advance in that child’s development. Exposure to the child’s home language in the first year of life provides the necessary input for the infant to develop sensitivity to the speech sounds of her or his home language or languages. During the preschool years, a child’s language will grow and develop through interactions with others. The quality and quantity of a child’s language performance will vary according to the interactional contexts to which a child is exposed. To ensure a child’s language --both receptive and expressive--is developing according to developmental milestones, early childhood professionals must administer multiple assessments to measure and track the language abilities of preschool children. A single measurement is inadequate. However, assessments alone are not sufficient by themselves. The use and application of language in various situations must be assessed. For example, providers need to gather information about how children act in different situations (i.e., interpret contextual situations). Therefore, the “gold standard” or “best practice” regarding language assessment is the use of a multimethod approach involving multiple informants (i.e., teachers, parents, caregivers). ICAN is the leading organization for children and youth communication, developing and delivering programs to support language and communication for children from birth to age 19 in the United Kingdom. Results from the 2015 Early Years Foundation Stage Profile revealed that about one-fifth of children do not have expected language levels when they begin school. For children from disadvantaged homes, nearly one-fourth of children are not meeting expectations. This study confirms previous findings that the most important factor for subsequent academic success is a child’s language skills at age five. Parent support for language development during the years leading up to school entry is crucial. Parents may require support to ensure they are providing optimal early language development for their children. Hart, B., & Risley, T. R. (2003). The Early Catastrophe: The 30 Million Word Gap by Age 3. American Educator, (Spring). Retrieved April 17, 2017, fromhttps://www.aft.org/sites/default/files/periodicals/TheEarlyCatastrophe.pdf. During the 1960s, the authors examined the language interactions of parents living in poverty and followed their children (age 7 months when the study began) for two and a half years. They found that by the time these children reached age 4 they had been exposed to 30 million fewer words than were children in middle and upper class families--a gap that continued to widen as children proceeded through school. Further, they found a child’s early life caregiver is responsible for most, if not all, social simulation leading to language and communication development. The conversational styles of the caregivers became the conversational style of the child. Additionally, they found that words of discouragement (negative directed-speech) were far more evident among children in poverty than they were for those not living in poverty. In short, the connection between what a parent/caregiver says and what a child learns is far more significant than had previously been believed. Lotfi, A. R., & Joybar, B. (2015). Theoretical Frameworks of Language Development A library Research. Modern Journal of Language Teaching Methods, 4(5), 420-430. Retrieved April 17, 2017, from https://www.aft.org/sites/default/files/periodicals/TheEarlyCatastrophe.pdf. For children to successfully acquire language, they must be in an environment that allows them to communicate socially in that language. This is crucial to language development regardless of the language being acquired. Exposure to language begins before birth and babies demonstrate an innate preference to listen to their mother’s voice when they are born. After birth, the environment to which a child is exposed will continue to influence their development of that language. Continuously hearing complex and complicated sentences will increase the child’s ability to understand them and use the complex language as they develop. This study of 70 parent-child pairs, found a positive relationship between language development, acquisition and home environment. This finding is consistent with previous research on the same topic. Using two measures--the Home Environment Questionnaire and the Peabody Picture Vocabulary Test-Fourth Edition--these authors were able to show that the relationship between SES and home environment is more impactful on language development than are the number of hours a child spent in childcare. Further, the authors found the Home Environment Questionnaire to be a valid tool for studying ways in which home environment affects child development. This finding further supports the critical importance of providing children with a language rich environment in the home beginning as soon as a child is born. Perkins, S. C., Finegood, E. D., and Swain, J. E. (2013). Poverty and language development: Roles of parenting and stress. Innovations in Clinical Neuroscience. 10(4). 10-19. There have been numerous research studies demonstrating the effects of poverty on the acquisition and development of language. Low socioeconomic status (SES) has been shown to be a dominant stressful condition associated with deficits in brain physiology in the regions associated with typical language development. Poverty has been found to have a particularly negative impact on executive function (skills that help an individual plan, organize and complete tasks) as well as memory (skill that allows an individual to hold important information and concepts in their minds), both foundational skills essential for language learning. The first three years of life are the most critical for language development. Children who demonstrate language deficits at age 5, have an up to 10 times greater likelihood of poor reading, spelling and math outcomes by the age of 19 than do children who have achieved appropriate language developmental milestones. Both the quantity and quality of the language used by parents have a significant impact on their child’s language development. Thus, high-quality early parent-child interaction is important for the development of the underlying skills necessary for language development. For parents living in poverty, these types of interactions are often limited or absent as parents are preoccupied with food, job and housing insecurity. There is, however, good evidence that educating the parents, especially mothers, how to provide rich language environments for their children will have long-lasting positive effects on child language developments and consequently on long-term health and welfare. For this study, the authors included 100 parents who had complaints of delayed language development in their children. Socioeconomic status (SES) is considered one of the most important factors linked to language development as it influences parental beliefs, attitudes, motivations and behaviors. These parents were ranked as having low, intermediate or high SES using a standard SES assessment. The majority of the parents (81%) were in the “intermediate” group and 19% were in the “high” group. None of the parents were in the “low” group. They weren’t convinced there involvement would work. The claimed they didn’t have the necessary skills. Claimed other family members were not helping. Believed the therapist needed to administer the therapy. Parental behaviors appear to be critical to a child’s language acquisition. Parent education therefore needs to include strategies, information and support to help them develop the skills necessary for them to develop their child’s language. Tamis-LeMonda, C. S. and Rodriguez, E. T. Parent's’ role in fostering young children’s learning and language development. Encyclopedia on Early Childhood Retrieved from http://www.child-encyclopedia.com/language-development-and-literacy/according-experts/parents-role-fostering-young-childrens-learning, May 4, 2017. The frequency of children’s participation in routine learning activities, such as shared book reading, facilitates vocabulary growth, phonemic skills, print concept knowledge and positive attitudes toward literacy. The quality of parent-child interactions expose children to varied and rich information about objects and events in the environment and can deeply influence outcomes. Provision of age-appropriate learning materials need to be provided for parent-child exchanges about specific objects and actions to be successful. There is irrefutable evidence that children’s early language and learning is important for later school readiness, engagement and performance. But more research is needed to understand why children from low-income and minority backgrounds are more likely to exhibit delays in language and learning at school entry and how to best support parents in their provision of positive home environments for their children. Parents need assistance to learn how to support their children’s learning. Teaching and guidance by professionals must consider the context of early development within different cultures when working with parents from different backgrounds. This review of the literature on the relationship of first and second language acquisition provides a strong argument for change in the traditional approach used to teach a second language. Children acquire a first language naturally through communication and interactions with others--parents, caregivers, extended family, neighbors, and the community. However, second languages are typically taught using grammatical rules, vocabulary and syntax in isolation and are not practiced community-wide. According to this author, the reason the majority of English-as-a-second-language learners fail is because they need social interaction and opportunity to practice the language communicatively. Further, second language learners may be content with less than target language competence or more concerned with fluency than accuracy. Children who are exposed to two languages hear less of each language than a child who hears only one. This article addressed a child’s acquisition of two spoken languages. These authors found that it takes children longer to get the same amount of experience with each language. It is not the case that learning two languages confuses the child or that it impairs their ability to acquire either language, but the child will not “magically” acquire two languages as quickly as he/she will acquire one language. Children whose first language is not English do not necessarily need to begin learning English along with their mother tongue. However, in the US children must acquire English language skills for school success. Over a four-year period, a panel of 13 experts in second language development, cognitive development, curriculum and instruction, assessment, and methodology selected by the Institute of Education Sciences synthesized research concerning the education of language-minority children and youth with respect to their attainment of literacy. Language-minority children are those whose first language is not the language of the majority of the community or school. This article provides a review of their findings. The findings show there is more we do not know about effective schools, theories, and education practices for literacy for second language learners than what we do know. The theoretical approach to the research examined and reported here was based on a monolingual English view of language and literacy development. Using this approach, monolingualism is presented as the “norm” and language-minority students are defined as being “not normal” or behind from the outset. In contrast, a bilingual or multilingual approach would include instruction in both the native and minority languages, with ongoing language instruction (grammar, usage, vocabulary, etc.) in both (or all) languages provided throughout a child’s education process. This study mostly shows there is a need for research into effective strategies and practices for English language learners (ELL). Gil, L. and Bardack, S.(2010). Common assumptions vs. the evidence: English language learners in the United States: A reference guide. American Institutes for Research. Retrieved fromhttp://files.eric.ed.gov/fulltext/ED511353.pdf May 6, 2017. In order to achieve academic success in the US, children whose first language is other than English (i.e., English Language Learners or ELLs) must achieve English proficiency to realize academic success. However, research has demonstrated that although a child can develop conversational English in about two years, it can take five to seven years to achieve academic English proficiency for ELL learners. Learning a second language at a young age can be beneficial to both language and brain development. The second language is typically learned through social experience rather than formal instruction. Thus, second language instruction for school aged ELL students must integrate their native language and culture to promote effective second language acquisition. Students whose first language bears only a slight lexical resemblance to English, will have greater difficulty learning content-specific vocabulary. Research shows that rapid, unsupported English language acquisition is not a realistic goal for ELL instruction. These students must continue to receive academic and cognitive development in their first language if they are to achieve the academic and cognitive demands of school after fourth grade. Thus, the curriculum must support ELL student’s academic and linguistic needs in both languages over a sustained period of time. Hammer, C. S., & Miccio, A. W., (2006) Early language and reading development of bilingual preschoolers from low-income families. Topics in Language Disorders Journal. 26(4), 322-337. Early language abilities predict early reading abilities. The complexity of learning to read increases when a child’s home language differs from that of the school, especially when the child comes from a home with limited economic resources. Previous studies have demonstrated that phonemic awareness is a powerful predictor of success in learning to read. Children who cannot distinguish among sounds or manipulate sounds in spoken words, will have difficulty learning how to map speech sounds to letters. Children who have not been exposed to English before attending school will require time to learn it. Research has shown that it takes a child whose first language is not English 2 to 3 years to “catch up” to their monolingual English-speaking peers conversationally. Additionally, it will take them 5 to 7 years to develop necessary academic abilities in English. During this time, children will need to be assessed in both languages to determine their development. Assessments also must be developed to measure bilingual child development. Language development is a function of the amount of exposure to a particular language the child experiences. Children whose daily exposure to language is divided between two languages are likely to hear less of each language. There has been research that demonstrates children learning two languages have skills at school entry that differ from the skills of monolingual children. These differences have not been well handled by traditional educational systems. For example, bilingual children have smaller English vocabularies than same-aged monolingual children because they have been acquiring two languages and vocabulary and grammar of both languages are not acquired at the same rate as monolingual development. Research has further demonstrated bilingualism is a statistically significant risk factor for poor academic outcomes, though it is likely there are other contributing variables such as SES. The research presented by these authors demonstrated that the English language skills of monolingual English-learning children (N=56) were more advanced and improved more rapidly than the English-language skills of bilingual Spanish and English learning children (N=47) on all measures of language development. Although data show it takes longer to acquire two languages than it does one, it does not take twice as long. However, as children get older the language gap grows. More research is needed to determine how to more effectively educate children in the US whose first language is not English. The purpose of this study was to describe differences in the bilingual experiences of children as a function of their parents’ native languages and to examine the effects of these sources of variability on their bilingual development. The 29 subjects in this study were 25-month old children who had been exposed to both Spanish and English from birth, with the less frequently heard language comprising at least 10% of their language exposure. All of the children lived in two-parent homes. The mothers of the children kept diary records of their children’s dual language exposure to English and Spanish over a seven-week period and provided information to the authors using the MacArthur-Bates inventories. The language proficiency of the parents also was measured. Nearly all of the parents who were native English speakers were monolingual (i.e., only spoke English) while two-thirds of the Spanish-speaking parents also had good English skills. Findings revealed that the children’s skill levels in each language were related to the amount of exposure to each language. Findings further suggest that non-native input is less supportive and useful to language acquisition than native input and it interferes with the natural communication between parent and child. This study measured language production only. Further research is need to examine factors that influence children’s ability to understand, even if they cannot produce, non-native languages. Productive competence in English is necessary to function in school in the US and is an important outcome for all children enrolled in US schools. While it is clear that early acquisition of a first language is crucial, it remains unclear if a critical period also exists for the acquisition of a second language. For individuals who are deaf and for who first language acquisition was delayed (either sign language or spoken English) outcomes have been highly variable. An outcome that is of great concern is that currently the average reading age for the deaf adults in the United Kingdom and the US is generally believed to be around 8 or 9 years of age. Previous research by Boudreault & Mayberry (2006) found that the age of first language acquisition affects an individual’s use of grammatically correct language. The conclusion is that delayed first language acquisition affects all subsequent language acquisition. Subjects in this study were deaf children of deaf adults. The authors of this study set out to test the claims of Boudreault and Mayberry and to develop a screening tool to assess British Sign Language (BSL) skills in deaf adults. Subjects included 10 native signers from deaf families and 20 non-native signers from hearing families. Subjects were grouped as: native signers, early learners or late learners based on participant report of their acquisition of sign language. Some of the participants in the “late learner” group appeared to have first language proficiency in English (considered by the authors to be a limitation of this study) but were included because of the difficult time the authors had recruiting deaf individuals who reported learning BSL as a first language during or after late childhood. No significant differences in BSL grammaticality judgement were found between the native signers and the prelingually deaf second language signers. The age of BSL acquisition was significantly correlated to reading age for the later learners only. In other words, the better readers were those who learned BSL latest. Crowe, K., McKinnon, D. H., McLeod, S., and Ching, T. Y. C. (2012). Multilingual children with hearing loss: factors contributing to language use at home and in early education. Child Language Teaching and Therapy, 29(1), 111-129. Which demographic factors most influence communication mode used by 3-year-old children? Which demographic factors most influence the use of a language other than English by 3-year-old children? Subjects for this study (N=106) were a subgroup of the Longitudinal Outcomes of Children with Hearing Impairment (LOCHI) study. A limitation of the study was that the majority of subjects came from less disadvantaged areas. All children were cared for by a female caregiver, the majority of whom had university education and used exclusively oral communication. Degree and age of identification of hearing loss and intervention were not identified as being influential in explaining communication mode or language use. Rather, these authors found that the factors that most influenced a child’s communication in the home environment were the female caregiver’s communication mode and language used. Likewise, the communication mode and language used in a child’s early education environment was mostly associated with the communication mode used in the child’s home environment. Secondary factors were identified and included the presence of a child’s additional needs and the female caregiver’s education attainments. Additionally, the inclusion of a male caregiver’s use of languages other than English could also be a factor. Gregory, S., (1996). Bilingualism and the education of deaf children. Paper presented at Bilingualism and the Education of Deaf Children: Advances in Practice conference. June 29, 1996, Leeds, England. Bilingual education for children who are deaf or hard of hearing refers to an approach to education that uses both the sign language of the deaf community and the written/spoken language of the hearing community. This approach is being offered in the US and other countries as an effective educational method for children who are deaf or hard of hearing. In the UK, where this author resides, British Sign Language (BSL) and English are used in bilingual education. This approach assumes there can be a transfer of skills from signing in BSL to reading and writing in English, though there is no evidence from other languages to suggest this is possible. According to the author, we cannot assume such a transfer is not possible. She goes on to state that there is informal evidence that deaf children of deaf parents do better linguistically and academically than do deaf children of hearing parents. Additionally, deaf children think differently than hearing children--a conclusion reached from research showing deaf children of deaf parents scored higher on performance tests of IQ than hearing children which, the author purports, could be attributed to different spatial ability although this has not been proven. Development of specific teaching methods for the teaching of sign language. Development of a sign language curriculum based on research (does not exist). Create assessment measures for sign language skill development (do not exist; research needed). Set goal to achieve age appropriate language development on entry to school. Work with parents during preschool years to develop early language skills in their children. Assessment of literacy skills is crucial. Identify resources needed to support the curriculum. Determine how to use sign language in assessments and how to evaluate its use. Determine the content for and number of courses teacher trainees require to work within a bilingual philosophy. The fact remains, however, that there is scant research to support the use of a bilingual education for deaf children. Human interaction is the best method for fostering language learning. This is true whether a child is learning one language or multiple languages. This finding has repeatedly been found to be especially critical for young children learning language. These researchers interviewed 24 economically and culturally diverse families in the Washington, DC area. All of these parents had the goal of raising their children (ages 0 to 5) to be Spanish-English bilinguals. The authors cite research that has demonstrated that successfully raising children to be bilingual is difficult in the US as most children eventually become English dominant or even monolingual in English. A major reason for this is the fact that English is the language of US public schools. Research is cited that suggest monolingual and bilingual children can meet major developmental milestones in two spoken languages at similar times and that there is no empirical evidence linking bilingualism to language delay of any sort. The authors apply these findings regarding spoken bilingual language outcomes to a literature review by Petitto and Holowka (2002) that concluded exposure to two “native” languages, such as ASL and English, does not cause a young child to be language delayed in either language. These findings are considered to have been confirmed by the findings of children using two spoken languages. What is critical to note, however, is language exposure--whether one or two languages simultaneously--must be provided by language models who are fluent in the language(s) in which a child is immersed. For the majority of children who are deaf or hard of hearing, language exposure is most likely to be provided by language models who are fluent in one or more spoken language. The author, a researcher in the Department of Linguistics at the University of CA-San Diego, used data from three experiments to examine the effects of age of acquisition (AoA) of a first-language on the successful acquisition of a second-language. According to the author, her findings demonstrate that the AoA is a critical factor for successful first language outcomes but is not a determining factor for second language outcomes. The author states she found that early acquisition of a first language “scaffolds,” or supports, reading skills in a second language, even when the first language is a visual language. This finding contradicts other research that has shown readers who are deaf and do not speak will have difficulty with second language literacy. Unfortunately, the author fails to provide critical information about her research, including the number and ages of study subjects; subject AoA of first or second languages; verification of AoA; measures used to determine nonverbal intelligence; measures used to determine language fluency; age of subjects at time of study. Without this important information the reported findings are not supported. Rhoades, E. A. (2017). Bimodal bilingual early intervention for families and their children with hearing loss: Is it empirically supported? Unpublished manuscript. The author reviewed the research literature frequently cited as demonstrating support for a bimodal bilingual approach for the education of children who are deaf or hard of hearing. Referred to as Bi-Bi, the approach maintains that children who are DHH can learn a signed language (e.g., ASL) and a spoken language (e.g., English) simultaneously. Research studies of hearing children learning two spoken languages (e.g., English and Spanish) is presented as evidence that the Bi-Bi approach has been proven to be effective. There is scant research demonstrating that children who are learning a signed and a spoken language perform in the same manner as children learning two spoken languages. Further, these studies do not provide sufficient information to support the claim that Bi-Bi education is effective nor do they specify or describe the intervention that is used or how the approach could be implemented in a classroom setting with a signing teacher and a speaking teacher. There is insufficient evidence at this time to support the Bi-Bi approach as an effective method of education for children who are DHH. Swanwick, R. (2016) Deaf children’s bimodal bilingualism and education. Language Teaching, 49(1), 1-34. doi:10.1017/S0261444815000348. This author completed a review of 160 peer-reviewed research or review papers and four books published since 2000 related to bimodal bilingual language development and educational practice. In this article, she presents the relevant research on deafness, language and learning. The terms bimodal and bilingual refer to the use of two or more modalities (such as sign, text, and speech) and two or more languages. Sign language and written language are the focus of this review. According to the author, the development of sign language is comparable to that of spoken language. In fact, the most significant finding of this review is reported to be that the neural systems supporting spoken language also support sign language and involve the left-lateralized network of the brain. However, the development of sign language fluency of deaf children who have hearing parents has been found to be problematic. They experience a general delay in language development and have difficulty catching up. This is due, in part, to having limited access to everyday conversation and routine interactions with other individuals who use the same signed language. The unfortunate result is that these children underperform in literacy in school, hampering their access to all other aspects of learning and the curriculum. However, deaf children of deaf parents where sign language is the shared language of the home, are generally more successful readers than deaf children of hearing parents. The model of bilingual education for deaf children purports that having sign language (i.e., ASL) as a first language can be the basis from which children develop literacy skills in a second language (i.e., English). However, deaf children whose first language is sign language are not learning the written form of the spoken language (second language) commensurate with other second language learners for whom both their languages are spoken. This is due in part to the fact that sign language has no written form to give deaf children prior experience in written language and to the fact that many deaf children have not attained fluency in their first (signed) language. There is a significant need for research on how visual phonics, speech reading, fingerspelling, and cued speech can facilitate written language development; how the rich oral and conversational experiences needed to support the development of text-based literacy skills can be facilitated through sign language; and the direct impact of visual phonics on the development of literacy skills. The evidence base of skills and strategies for making links between sign and spoken/written languages to support bimodal bilingual deaf children’s literacy development effectively must be developed. There is currently no agreement in the international literature regarding what comprises a bimodal bilingual approach to teaching. Rather than focusing on modality issues as much of the research to date has, the focus needs to be on examination of the dynamics of the use of sign language in the classroom. Andrews, J. F., Byrne, A., and Clark, M. D. (2015). Deaf scholars on reading: A historical review of 40 years of dissertation research (1973-2013): Implications for research and practice. American Annals of the Deaf, 159(9), 393-418. Is reading qualitatively similar for deaf and hearing individuals? Is reading ability qualitatively different for deaf and hearing individuals? None of the studies reviewed by the authors clearly answered these questions. Additionally, the sample sizes used in the studies were all too small to derive generalizations from them. There were, however, some noteworthy findings. Factors that contributed significantly to English acquisition included parental acceptance of the child’s hearing loss, socioeconomic status, early language exposure, practice in writing, and the importance of community cross-cultural communication. Knowledge and use of ASL alone was not found to be a significant contributor to the ability to become proficient in English. A significant contributor to the acquisition of English for academic access (i.e., reading) was found to be parents/caregivers who served as good language models for the children from a very early age. Good language input at school alone was not found to be sufficient. There were conflicting findings regarding how to teach English when a child’s first language is ASL. Several studies reported comparative analysis lessons in ASL lead to better understanding and acquisition of English. Others argue that no intermediary system is needed to go from ASL to English. What was clear is that the development of literacy is dependent on having an opportunity to develop a language. Without sufficient competence in a first language, complex dialoguing with others who use the same language is not possible. The authors conclude that the pathway to literacy development, when comparing deaf signing children with hearing children, is distinctively different. And, perhaps more importantly, the authors state that additional research is needed to understand how deaf children learn to read, understand and write English when their first language is ASL. Teachers must understand how children learn to read from the perspectives of both the hearing and deaf epistemologies in order to be fully prepared to teach deaf children to read. Decker, K. B., Vallotton, C. D. & Johnson, H. A. (2012). Parents’ communication decision for children with hearing loss: Sources of information and influence. American Annals of the Deaf, 157(4), 326-339. Research regarding communication choice has shown that parents’ decisions are influenced by the medical or education professionals with whom they come into contact. Additionally, many parents will seek information on the Internet. However, the 36 parents who responded to this on-line survey indicated their own judgement was the most common factor that influenced the method of communication they chose for their child. There were no significant differences between the parents in regard to the sources of information they indicated as being influential. However, the choices parents made were influenced by their view of deafness as audiological (these parents chose speech only) or sociocultural (these parents chose a method that included sign). It is important to note that the sample was relatively well educated, caucasian, primarily female, and had moderately high incomes. Li, Y., Bain, L., and Steinberg, A. G. (2003). Parental decision making and the choice of communication modality for the child who is deaf. Archives of Pediatric and Adolescent Medicine, 157, 162-168. Retrieved from http://jamanetwork.com/pgfaccess.ashx?url=/data/journals/peds/11791/ on 4/25/2017. The results of a survey of about how parents/caregivers of children who are DHH chose a communication option for their children are reported in this article. They found that the information parents received was influenced by the opinions, beliefs and attitudes of the professionals (health and education) who provided the information and parents considered their recommendations important. The availability of specialists and resources to support the parents’ choice was also a factor. For example, if a parent wanted their child to hear and talk, they needed assurance that therapists and teachers who knew how to help them achieve this goal were available to them. Results of the survey showed that the degree of the child’s hearing loss was the most important factor in parental decision-making followed by the goals and aspirations parents had for their child’s ability to speak. In other words, parental values of signed vs. spoken language influenced their decisions. Parents who wanted their children to attend the neighborhood schools alongside hearing peers were more likely to choose a spoken language approach. The results of this survey are limited in generalizability, however, because the respondents were predominantly white, middle-class and well educated. However, we should not use this pattern to assume anyone of a different race, SES or educational level does not want their child to hear and talk. The research reported in this article was conducted as the first stage of a national (England) research and development project to produce policy and practice guidelines on “informed choice” in service provision for families with deaf children (birth to 3). Using a meta-analysis, the authors examined research on informed choice conducted outside the field of children who are deaf or hard of hearing and their families so as to challenge the overcontextualized meanings attributed to “informed choice” among parents and professionals in the field of deafness. Parents may be making choices without having access to all relevant information. Not all choices are available to all parents because some are denied, unacknowledged, or not funded. The professional-parent relationship is not an empowering one if the attitude and bias of the professional predominates, thereby intimidating the parent. Informed choice, therefore, must be about understanding and not simply providing information. Information must be evaluative and draw attention to the risks and benefits of each option. Parents must understand that in making one choice rather than another, they are also choosing an associated set of risks and benefits. Informed choice is a consequence of understanding. Professionals must be up-to-date with accurate and evidence based information they share with parents. Informed choice also raises ethical questions. Is it ethical to provide information about all options even though all options are not offered due to lack of resources, skills or services? Or only focus on what is available and achievable? In other words, is informed choice setting up unrealistic expectations for families? In the deaf child context, the essential question of what is and what is not amenable to informed choice is played out in highly politicized terms. Is it possible for parents to make an informed choice to refuse hearing aids for their child? Would we feel equally strongly about parents who refuse sign language access as we might about parents who refuse hearing aids? Informed choice is not only defined by good-quality, relevant information but also reflects the decision maker’s values. Geers, A. E., Mitchell, C. M., Warner-Czyz, A., Wang, N., & Eisenberg, L. S. (2017). Early sign language exposure and cochlear implantation benefits. Pediatrics, 140(1):e20163489. Despite assertions that the benefits of learning sign language outweigh the risks, few studies have directly compared spoken language outcomes for similar groups of children learning language with and without the addition of sign. These authors report on their study of 97 children whose spoken language learning occurred in one of three ways--no sign, short-term (< 12mos.) sign, or long-term sign. This research revealed that children with cochlear implants who did not have exposure to early sign language during the first three years post implant exhibited a statistically significant advantage in spoken language and reading near the end of elementary grades compared to those children exposed to sign language. More than 70% of the non-signing children performed significantly better than the children exposed to sign language. The authors acknowledge that since all children in the study had normal hearing parents who were not native signers, it is possible the sign exposure provided by them was not sufficient to promote spoken language development. Thus, the potential benefits of early sign language input from accomplished signers may not be adequately represented in this study. Still, these findings indicate that when spoken English communication and literacy are the primary goals for a child with a cochlear implant, the focus on early spoken input increases the probability of achieving these goals. In this study, the authors addressed whether the advantages demonstrated previously by children who received a CI before 24 months of age persisted into their mid-elementary school years. Additionally, they looked at whether or not the addition of a second CI between ages 4 and 10 provided an additional advantage regarding language skill development. Language samples and parent ratings at ages 3.5, 4.5 and 10.5 were reviewed. Findings demonstrated there were clear advantages for younger CI recipients with regard to spoken language when they reached mid-elementary school. The benefits of early implantation outweighed those of children who had used a CI longer. These findings document a language advantage for children who received a CI at a young age and that these advantages continued well into their elementary school years for overall receptive and expressive language. Geers, A. E., Strube, M. J., Tobey, E. A., Pisoni, D. B., and Moog, J. S. (2010). Epilogue: Factors contributing to long-term outcomes of cochlear implantation in early childhood. Ear and Hearing, 32(1), 84S-92S. Information capacity of immediate memory for a group of adolescents who had received CIs in the 1990s was examined in this research study. Specifically, the authors wanted to understand how communication mode in early elementary grades influenced skills exhibited in high school. Outcome measures obtained in early elementary school were compared to those obtained in high school for language, reading, and social adjustment. Results showed that children who demonstrated the best vocabulary and syntax skills in elementary school, achieved the highest literacy performance scores in high school. The authors also found that those children who had a shorter duration of deafness before receiving a CI had better long-term outcomes. In other words, the younger the better. These authors also examined how sign enhancement during the early elementary grades influenced later performance outcomes in adolescence. They found that children who relied on spoken language in elementary school, demonstrated better verbal rehearsal skills and higher levels of speech perception, speech intelligibility, language and literacy in high school than did those children who relied on sign enhancement. This author presents “evidence” to show deaf children of deaf parents (N=7) who received a cochlear implant performed better on measures of auditory perception, speech production and language development than did deaf children of hearing parents (N=7). The author attributes the better performance of deaf children of deaf parents to their early acquisition and use of sign language and recommends that deaf children be encouraged to use sign language from a very early age (defined as pre-CI). Unfortunately, insufficient information about this study is provided and the conclusion that the use of sign language prior to a CI will improve their ability to learn spoken language after the CI is not supported. The sample size is too small; the assessments were not administered to the children pre-implant to provide a baseline; there is no mention of whether the children who used sign language also used spoken language; there is no explanation of how the assessments were administered to signing children who did not use spoken language; and, the nature and type of early intervention services and therapies the children received are not described. Moog, J. S., Geers, A. E., Gustus, C. H., and Brenner, C. A. (2015). Psychosocial adjustment in adolescents who have used cochlear implants since preschool. Ear and Hearing, 32, 75S-83S. The psychosocial characteristics of 107 high school aged students who had used a cochlear implant since preschool were examined in this study. The students, ages 15 to 18, or their parents completed a questionnaire describing their social skills along with a control group of 46 hearing teens. The teens with CIs had been previously evaluated on psychosocial characteristics while in elementary school at which time the parents perceived their children to be socially well adjusted. Of the high school aged CI students, 70% who responded to questions about their group identification expressed a strong identification with the hearing community or a mixed identification with both deaf and hearing communities. The majority of the students used spoken language as their primary means of communicating and exhibited high levels of self-esteem. There appears to be a positive correlation between students who achieved higher speech perception scores and language scores closest to those of their hearing age-mates and strong identity with the hearing world. Additionally, these students were involved in extracurricular activities similarly to those reported by the control group of normal hearing teens. The authors note that the families of the study participants were highly motivated from the beginning and thus may not be representative of the population of CI children as a whole. Quittner, A.L., Cruz, I., Barker, D.H., Tobey, E., Eisenberg, L. S., and Niparko, J.K. (2013) Effects of maternal sensitivity and cognitive and linguistic stimulation on cochlear implant users’ language development over four years. The Journal of Pediatrics, 162(2). The focus of the research reported here was on the early language development of children who received a cochlear implant before 2 years of age as compared to children who had received one after the age of 2. Data for 188 children with CIs and 97 hearing children from the Childhood Development after CI (CDaCI) cohort were include. Using both structured and unstructured tasks, parent-child interactions were observed and videotaped over a period of 4 years post implant. Maternal sensitivity, along with cognitive and linguistic stimulation provided by parents were analyzed. The data showed that by 4 years post implant, children who received a CI before 2 years were 1.37 years less language delayed than those who were implanted at 2 years or older. Neither of these groups demonstrated “catch-up” growth compared with normal hearing peers. However, children whose parents demonstrated higher maternal sensitivity and linguistic stimulation exhibited less language delays than those whose parents did not. The data revealed that age of onset of hearing loss, time with amplification pre implant and the level of hearing in the better ear were significantly associated with language learning, but parenting behaviors were found to significantly affect the growth of oral language. The authors recommend that CI programs incorporate maternal sensitivity training into their offerings. Purportedly, the English literacy of deaf children is positively correlated with their sign language skills such that proficiency in a signed language, such as ASL, will lead to the successful acquisition of the skills necessary for literacy. This premise was the basis for the research reported here. The authors found that students “highly proficient” in ASL outperformed their “not highly proficient” ASL peers on nationally standardized measures of reading comprehension, English language use, and mathematics. The linguistic and background variables that influence reading comprehension skills and academic achievement of 85 deaf signing 6th through 11th grade students were examined to determine the effects of ASL proficiency on comprehension abilities and academic performance. There is no explanation of who or how the students were rated on ASL proficiency or on any of the many other variables leading to language acquisition, such as SES, language of the home, parental hearing status, etc. However, given that the vast majority of the “highly proficient” deaf students had deaf parents and used ASL at home implies that these students were exposed to a language rich environment at a very young age (2 months of age on average), with parents who were fluent language models and who facilitated the acquisition of fluency in a first language. Additionally, these students began their formal schooling at the deaf school at age 5 years 10 months (mean). The students who had hearing parents, lived in homes where the primary language was English, were not exposed to sign language until 6 years 5 months (mean) and did not enroll in the deaf school until age 10 years 8 months (mean). These factors imply that these students did not acquire a foundational language during their early years and enrolled in the deaf school after experiencing limited success in another educational setting and an age well beyond the optimal language learning age of birth to 3 years. In 2012, an international panel of experts including parents, deaf professionals, early intervention program leaders, early intervention specialists, and researchers from 10 nations gathered to identify family-centered practice principles specific to partnering between families of children who are DHH and providers for the purpose of providing early intervention. The following 10 foundational principles were agreed upon and a worldwide “call to action” issued to share the principles throughout the field, use them to support research agendas through collaboration or examination of practices, and to embed the principles in legislation, guidelines, consensus papers and position papers. Screening and confirmation that a child is DHH will be effective to the degree that they are linked with immediate, timely, and equitable access to appropriate interventions. Family-centered early intervention (FCEI) will focus on developing balanced partnerships between families and the professionals supporting them. Family-provider partnerships are characterized by reciprocity, mutual trust, respect, honesty, shared tasks, and open communication. Professionals promote the process wherein families gain the necessary knowledge, information, and experiences to make fully informed decisions, including educating families regarding special education laws and their rights as defined by these laws. Decision making is seen as a fluid, ongoing process. Families are connected to support systems so they can accrue the necessary knowledge and experiences that can enable them to function effectively on behalf of their D/HH children. Families and providers work together to create optimal environments for language learning. Providers must be skilled in the tools, assistive devices, and mechanisms necessary to optimally support the child’s language and communication development. Providers are well trained and have specialized knowledge and skills related to working with children who are D/HH and their families. An optimal FCEI team focuses on the family and includes professionals with experience in promoting early development of children who are D/HH. FCEI is guided by regular monitoring/assessment of child and family outcomes. FCEI programs evaluate provider adherence to best practices and include quality assurance monitors for all program elements. Sass-Lehrer, M. (2016). Early intervention for children birth to 3: Families, communities, & communication. A Resource Guide for Early Hearing Detection and Intervention. NCHAM:Logan, UT. Families look to professionals to guide and support them as they strive to make the best choices for their child and family. They also benefit from the input of their extended family, their community and from other parents who have children who are DHH. Additionally, parents report they experience tremendous benefit from meeting and talking with older children and adults who are DHH. These interactions help parents better understand what it means to be deaf or hard of hearing. A central focus of early learning and development for children who are DHH is on the acquisition of language and communication skills. Early intervention service providers are valuable resources for parents and children. Early intervention providers have the ability to educate parents and teach them skills they need to develop their children’s language through modeling and coaching. They also help parents assess their children’s language development using developmental milestones of language over time. The biggest impediment to successful early intervention providers is the ability of a parent or caregiver to participate adequately in their child’s development. Although deaf students enrolled in mainstream schools were not found to be rejected by their hearing peers, they did report feeling isolated. This was the conclusion of the authors of this article on social relationships. Using peer ratings, sociometric status and interviews for all the children, ages 11 to 13, in mainstream classes at two schools, the authors examined the social relationships for 9 deaf students. Results showed there was no significant difference between deaf and hearing students who felt socially rejected. Nor was there any evidence that the deaf pupils were at risk for being disliked by their hearing peers. There was confirmation that communication problems do arise some of the time (the deaf students in one school used total communication and those in the other school used spoken English) but that this did not interfere with social acceptance. These students reported feeling socially isolated and lonely and they had lower self esteem “than students in special schools” although the authors did not include students from special schools in this study. They did, however, rely on reports by others that concluded special schools for the deaf foster socio-emotional growth better than mainstream schools, including reports from deaf adults who attended special schools and who reported positive memories of their school days. This conclusion was not supported by this research that found deaf students did not seem to encounter strong negative feelings in mainstream schools in their relationships with their hearing peers. Qi, S. and Mitchell, R. E. (2011) Large-scale academic testing of deaf and hard-of-hearing students: Past, present and future. Journal of Deaf Studies and Deaf Education, 17(1).doi: 10.1093/deafed/enr028. In this article, a summary of historical data from three decades (1980s through 2010s) is presented and trends in academic achievement for students who are deaf or hard of hearing is presented and discussed. Two important issues guided the authors. First, a significant proportion of students who are DHH are neither on grade level nor receiving instruction in the general curriculum. Second, many students who are DHH receive classroom instruction through sign language or in some other visual communication mode. For these students, English is not their primary language of academic instruction and interaction and many have limited English proficiency. Since there are no standardized tests of academic achievement that have been translated into ASL the ability to fully assess students whose first language is ASL is limited. Practical considerations such as funding and lack of psychometric studies of children who use ASL have prevented such tests from being developed. A special version of the Stanford Achievement Test Series for children in Kindergarten through Grade 12 used most frequently to assess achievement, was developed through a special norming process in 1974. This test is now outdated and can only be used with caution to assess the achievement of children today. The authors identify three patterns of trends over the 30-year period they examined. The academic performance of students who are DHH is consistently below hearing students in reading and math. The gap is larger for reading than for math. Gaps between students who are DHH and those who are hearing have not closed from 1980-2011, with the possible exception of mathematics problem solving. Students who are DHH are most commonly included in their state’s assessment program largely by accommodation with the most common adaptations being provision of an ASL interpreter, extended time, testing in a separate location and computer administration. Unfortunately, these accommodations lack validation studies. The lack of a uniform curriculum across classrooms and schools for students who are DHH further complicate the challenge of achievement testing. Students who are DHH must have the opportunity to receive instruction in the general curriculum upon which achievement tests have been developed. Regardless of when and which languages students have acquired, limited access to the spoken English language environment around them adversely affects the opportunity for students who are DHH to learn the language from many common auditory channels such as radio broadcasts, spoken conversations, etc. which are easily accessible to hearing students. Their lower performance on tests could be an indication of inadequate exposure to English. Research is needed to explore the use of modified English and ASL adaptations of standardized tests. Modified English has been used with students who have English as a second language (ELL) and these students have been found to perform better than those tested with the original, or unmodified, version of the test. Adapting tests from English to ASL is more difficult since there is no published research indicating how such a translation affects the structure and difficulty of the test items. “Very little independent research activity has provided any evidence to fill the psychometric near vacuum for modified English or ASL-adapted state tests.” The authors conclude by stating that extensive psychometric research employing experimental designs is urgently needed to develop standardized tests for students who are DHH and who use ASL.